Plastic surgeons tend to prefer a laser with a relatively strong output, possibly because their experience in surgery makes them not easily impressed by a laser of less effectiveness. 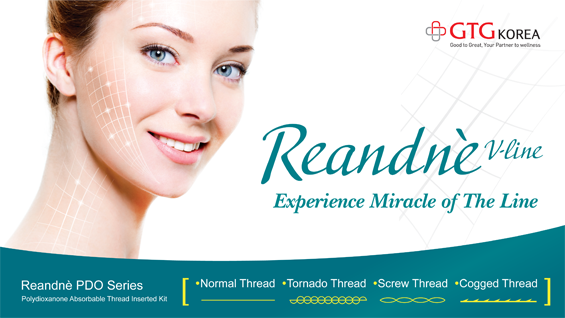 They also tend to prefer a laser that has been used for the longest time, because they can understand the advantages and disadvantages of the laser after multiple times of use. For this reason, I prefer to use VENTUS (UNION MEDICAL, Er:YAG laser), VENUS PLUS (UNION MEDICAL, Q-switched laser) and Sellas (DINONA Teratech, Er:glass fractional laser). I mostly prefer products made in Korea, because they provide a satisfactory effectiveness for the money. I also hope that Korean companies would release a variety of devices that can surpass famous brands worldwide by actively absorbing the latest technologies that are introduced at international conferences and exhibitions. Er:YAG laser does not leave a burn and less damage compared to CO2 laser. Although bleeding may occur, fast healing and rare side effects are the advantages of VENTUS. Disadvantages are the risk of bleeding and slight pain after deep energy penetration. Unlike CO2 laser, which is a frequent cause of hyperpigmentation, VENTUS using Er:YAG laser causes less side effects. The relatively strong output compared to other lasers may induce hyperpigmentation; however, hyperpigmentation lasted for 4 months at most in a patient with chloasmata. UNION MEDICAL, the manufacturer of VENTUS, also provides quite satisfactory customer service. The absence of the expenses for consumables is one of the strongest advantages of VENTUS. 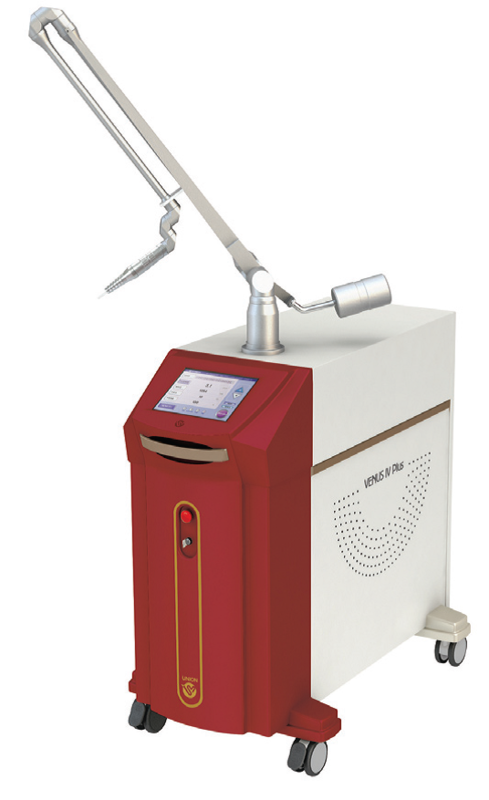 VENUS is a Q-switched laser also manufactured by UNION MEDICAL and is often used for pigmented lesions such as shallow freckles and nevus of Ota. It rarely causes a side effect when used on the face; however, surgeons should keep in mind that VENUS on the body may cause 3-4 folds delayed side effects than on the face. One of the advantages of VENUS is rapid irradiation, which saves a lot of procedure time. Plastic surgeons particularly prefer rapid lasers so much so that they sometimes say they feel depressed when using a slow laser. In this regard, VENUS would be an attractive device. Rotational change between spot sizes also makes the laser easy to use. The most important advantage would be that it does not require the expense for consumables and provides good customer service. The manual offers a stable parameter, and procedure within that parameter seldom causes a side effect. However, care should be taken when treating patients with chloasmata, previous use of other agents, history of chemical peel and past experience of side effects from use of unknown cosmetics. Taken together, VENTUS and VENUS are not very luxurious devices but their superior therapeutic effects compared to the price make them very useful lasers, if only used by a skillful specialist. I started using Sellas, an Er:glass fractional laser, by strong recommendation of a dermatologist. 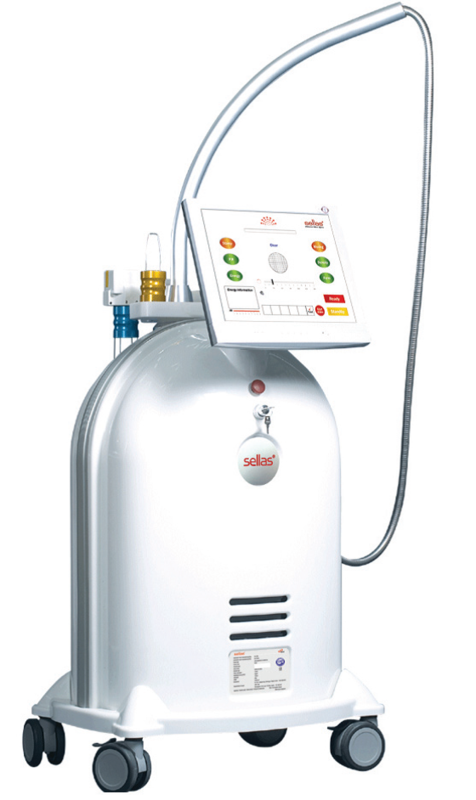 Considering the preference of a fractional laser with strong output by plastic surgeons, Sellas also suited my taste. I’m currently using Sellas for mild acnes, acne scars, fine wrinkles and wrinkles around the eyes. Pain would be one disadvantage of Sellas. Anesthetic ointment, freezing or anesthetic injection may be used to reduce pain in sensitive patients. The skin becomes slightly red on the day of procedure, which does not interfere with daily life if a BB cream is applied from day 2. The scab falls off from day 5, and patients can enjoy normal activities from day 7. Three to four procedures at the interval of one month is effective on average. The manufacturer provides satisfactory customer service and there is less need for the cost of consumables. However, slightly smaller handpiece and more diverse spot size would have made Sellas a better device.